This was taken on a very special day. It was very stormy and the light was just amazing. Because of the storm the sky was changing fast and just before the sunset it was absolutely magnificent and the sky was more red than it was earlier that day. When I took this picture I just reduced the light and by doing that the sky became a little more red than it actually was, but I liked that more so I kept it that way. In photoshop I used "levels" and "brightness and contrast". Then I used "curves" just a little, and that was all. Wow, is that for real?! Awsome. The color blows me away. Wow, I would love to have seen this in person! Awesome colors! 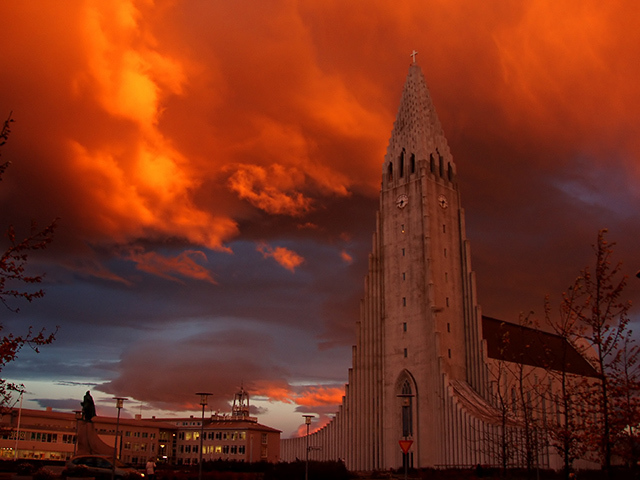 Reykjavik cathedral. Did you play with the saturation of the original? Nice effect. Another lovely shot with a red/orange sky. But I like the composition AND the color in the sky.. This is a nice shot. I would have probably rated it higher if the orange wasn't quite so saturated. The building in the bottom left is distracting - a different angle with only the church and the sky would have been more striking. Great colors, they are stunning. great colors almost feels like i'm there. congratulations !!! All in all one of the very best shots I have ever seen of Hallgrímskirkja, I gave it a 9. Looks a bit overdone in post processing but it doesn't have to be. The sunsets were spectacular in the beginning of October. My goodness!! That is just crazy!! Proudly hosted by Sargasso Networks. Current Server Time: 04/23/2019 06:03:07 PM EDT.